Set amid a dramatic landscape that is characterized by pristine beaches, jagged cliffs, and the thumping roar of the Atlantic surf, it is little wonder that the creative team at Memmo Baleeira looked to its surroundings for design inspiration. The hotel’s former white-on-white aesthetic has been lifted with earthy tones and the use of raw, natural materials, while clusters of lush foliage are a nod to the area’s pastoral verdure. In the public areas, neutral, sand-colored rugs and sofas upholstered in tonal linens add warmth while maintaining the hotel’s unique brand of restful minimalism, allowing for its spectacular locale to take centerstage. The hotel’s 144 guestrooms feature a refreshed color palette of greys and browns, augmented by signature design pieces such as the blue-and-white throws traditionally crafted from pure mountain wool by sustainable Portuguese brand Burel. Paying homage to the area’s gastronomic heritage is central to the ethos of the hotel’s first-floor restaurant Fornaria Memmo. An open wood-fired oven is at the heart of the culinary concept, which focuses on regional produce and locally-caught fish prepared simply in dishes such as “roasted octopus in rosemary olive oil” and “black linguini with shrimp and cuttlefish”. The refreshing simplicity of the menu is complemented by the clean lines of the restaurant’s interiors, which are defined by off-white walls and natural wooden cabinetry. Cozy rattan sofas with plush throw cushions and Scandinavian chairs from the hotel’s original Sixties’ incarnation sit alongside modern design masterpieces from the likes of Philippe Starck and Tom Vac, while the stoneware is a feat of ceramic craftsmanship courtesy of Costa Nova. 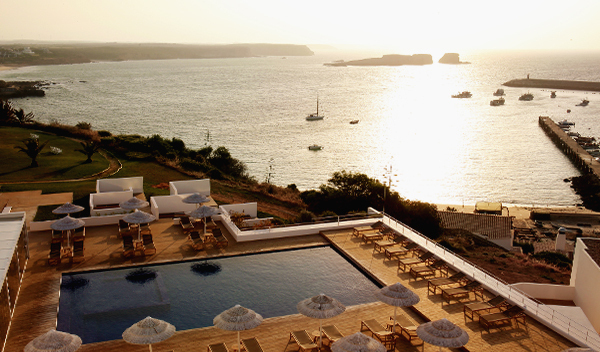 From its position stretched flat on a hill, Memmo Baleeira overlooks the charming village of Sagres and, of course, the vast expanse of windswept coastline. Providing the perfect perch from which to soak up the breathtaking views, the outdoor pool area has undergone a complete transformation. A sun-drenched deck dotted with loungers frames the heated pool, while the newly established poolside bar ensures that sundowners flow way past sunset. For those drawn to the siren call of the crashing waves below, the hotel’s new surfboard store and rental is a very welcome addition to Memmo’s existing surf school that offers unrivalled access to the Sagres surf scene. The bike station, on the other hand, opens up the myriad of trails through the brooding clifftops and heady eucalyptus woods to give guests an invaluable insight into this untamed corner of the Algarve. Closer to home, smaller guests are well served by the opening of two children’s play areas, complete with climbing wall and trampolines. Meanwhile, adults can unwind and recharge at the enhanced wellness area, which features an indoor pool, sauna, Turkish bath, and spacious gym. For high resolution images and more information on our member hotels, please register on the Design Hotels™ Virtual Press Office designhotels.com/press. To download the images directly, click here. For reservations, please refer our website designhotels.com or find the appropriate Design Hotels™ toll-free number designhotels.com/toll-free-numbers. Design Hotels™ represents and markets a curated selection of over 300 independent hotels in more than 60 countries across the globe. More than a collection of hotels, the company is a collection of stories. Each property reflects the ideas of a visionary hotelier, an "Original", someone with a passion for genuine hospitality, cultural authenticity, thought-provoking design and architecture. Each "Original" stands for the individual, aesthetic and service-driven experience that his or her hotel provides. Founded by Claus Sendlinger in 1993, Design Hotels™ offers its members insightful travel industry knowledge, from market trend consultancy to international sales representation. The company has its headquarters in Berlin and branches in London, Los Angeles, New York and Singapore. Executive Board members are: Peter Cole (CEO), Serdar Kutucu (COO) and Sascha Wolff (CFO). In 2015, Design Hotels™ joined forces with Starwood Preferred Guest (SPG®), enabling its member hotels to have both a greater and more selective reach while offering its Community the benefit of a prominent loyalty program. Since 13 February 2019 Marriott International unites the former SPG®, Marriott Rewards® and The Ritz-Carlton Rewards® into the leading loyalty program of the industry: Marriott Bonvoy. 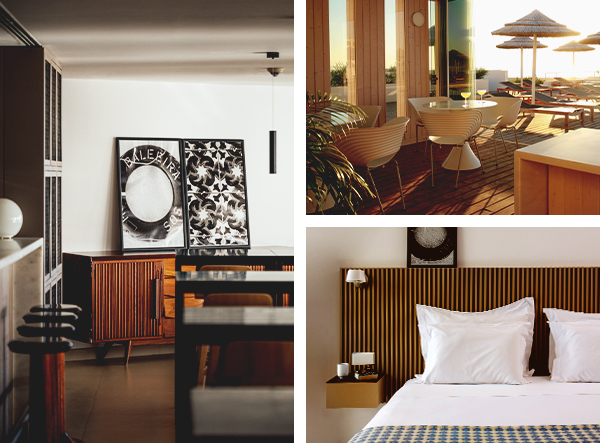 Members can earn and redeem point in participating Design Hotels™ members.